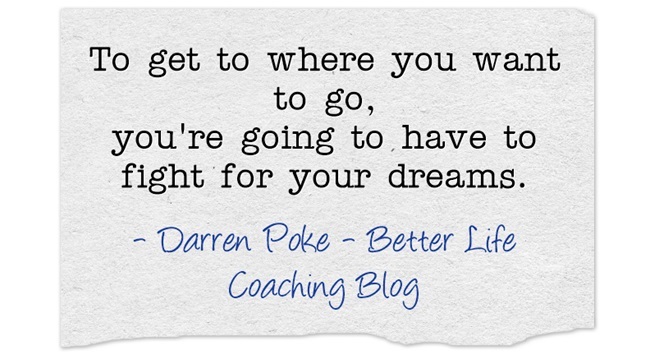 To get to where you want to go, you’re going to have to fight for your dreams. You have to battle the temptation to settle for second best from yourself. You have to drag yourself back up from the canvas when life knocks you down. You have to wrestle with your doubts. You have to want it more than the other guy. You have to look for opportunities for massive gains, not small, insignificant victories that mean nothing. You have to maintain a disciplined mind, body and spirit, not become flaccid and sloppy. You have to take risks in spite of your fears. You have to maintain morale when under heavy fire. You have to keep going when every internal and external voice is telling you to stop. You have to say no to every no that is said to you. You have to stay focused on your objective when distractions try to get you off track. You have to grit your teeth and stay the course. You need a warrior spirit. You need a resilient attitude. And if you keep fighting for your dreams, you’ll get there in the end. Awesome article. Thanks 4 sharing. This is great encouragement. Thank you.